Halloween weekend is no joke in the city that never sleeps, and luckily BangOn! 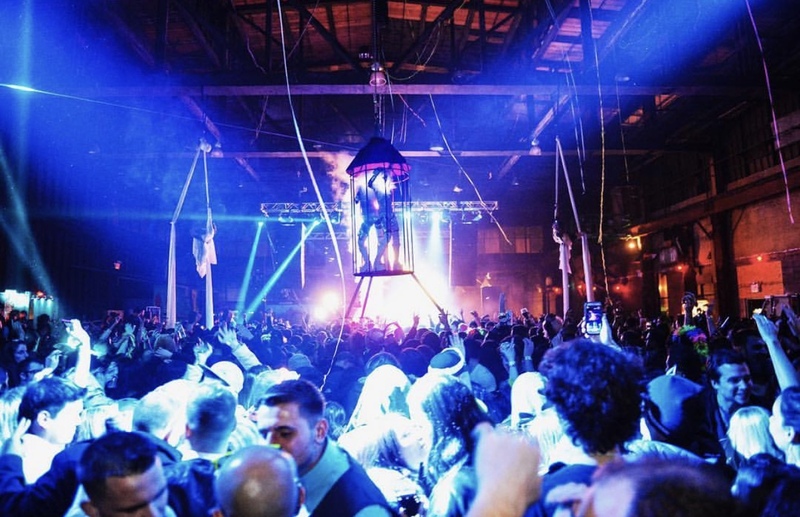 NYC was able to successfully put on their spectacular Warehouse of Horrors production in Brooklyn this past weekend. With its banging beats and spooky decor taking over for two consecutive days, the event celebrating BangOn!’s 10th year anniversary was nothing short of extraordinary. A true haunted warehouse experience for music lovers seeking a little thrill, this year’s curators definitely put on a show. Upon arrival, those old school warehouse vibes immediately took over, as we witnessed attendees exploring in their intricately planned out costumes just grooving along to the mesmerizing sounds blasting throughout. Terrorizing decor was dispersed around the venue and eclectically dressed up creatures roamed around to add to the atmosphere’s already existing suspense. As the only two-day warehouse mini festival in the city for the weekend, it was definitely the it spot during one of the most festive weekends of the year. The Earth stage exposed some pretty intricate sounds from some of the most uniquely talented artists in electronic music, allowing for some attendees to discover sounds they probably had never witnessed before. On day one, G Jones absolutely crushed his entire set, as it was actually the first day that his new album ‘The Ineffable Truth’ had been released. Right afterwards, Gramatik mesmerized the crowd with his funky yet filthy tunes for almost an hour and a half. Ye and Bandlez closed off the night until 5 AM, throwing down hard enough that the crowd didn’t even want to leave that late into the night. Night two consisted of similarly intriguing artists including EPROM, Space Jesus, Yheti and more. With artists like that, who would want the night to end? Crossing over into the Fire stage, we had to bypass a walkway full of uniquely designed accessory vendors, tarot card and psychic readers, and even more perplexing creatures. What a way to add to the thrill along the way. As the house stage of the event, deep sounds from artists like The Golden Pony, Dirtybird’s own Walker & Royce, Dirty Looks, and more took over to start of Halloween weekend right. On the second night, Klingande completely blew the crowd away with his live piano and saxophone sounds, presenting a vibe attendees were surely digging. Right afterwards, Goldish crushed it as well, with their funk-house sound and jazzy sax notes completely electrifying the crowd. The last few hours of the event flew by with a special Bangon b2b set, and once again it was difficult to get attendees to leave the venue when it came down to the end. From it’s spooky sets to thrilling installations, there was no better way to party it up and celebrate Hollow’s Eve than at BangOn!’s Warehouse of Horrors. With a stacked lineup full of some pretty exquisite talent, what more could we have asked for this past Halloween weekend? Surely hair-rising, this haunted warehouse dance party was everything we had imagined and more.